/ Recent developments / Rules and regulations / Remember landing? It always worries me that, bit-by-bit, our public rights can be eroded away simply because we don’t know when – or how – to protect them. I was made aware of just such a situation last week when I attended one of the regular meetings of RUG8 – the River Users’ Group, section 8, a forum designed to keep river users up to date with developments affecting the river from – in this case – Bell Weir Lock in Egham all the way down to Teddington. RUG8 secretary Bernard Hales told the meeting that an historic public landing place on the Surrey side of the Thames at Thorpe was in danger of being lost for good because public access was being prevented by a fence erected next to a property in Chertsey Lane. Bernard tells me that the landing place is approximately 100 yards upstream of Truss’s Island lying between two riverside properties and that it is currently owned by Surrey County Council. The landing is almost exactly opposite Wheatsheaf Lane steps on the Middlesex bank of the river and there seems to have been a ferry crossing between the two landings at one time. The entrance to the landing on the Thorpe side has apparently been fenced off for many years. Without going into all the details, the problem seems to have occurred following Surrey County Council’s decision to requisition several tracts of land, mostly consisting of timber bungalow plots, from the Thames Conservancy. The original idea was that Surrey intended to clear the land and create a public open space by the waterside as part of an initiative called Windows on the River. That idea died a death but eventually the land was sold on to Runnymede Council who did create the public open space at Truss’s Island. However, part of the land – including the public landing area – was retained by Surrey and RUG8 is now doing its best to ensure that the public landing – and access from it to Chertsey Lane – is re-established. Although historical records including the Thorpe Enclosure Map of 1811 and the Thorpe Tithe Map of 1840 both show the Thorpe public landing (and the Thames Conservancy also endorsed the idea in 1924) Bernard is keen to hear from anyone who remembers people actually using this public landing to establish that it really was a public access. I know it’s a long shot but I wonder whether any Riverwatch readers can help? If so, please contact me with details and I’ll pass them on to Bernard. 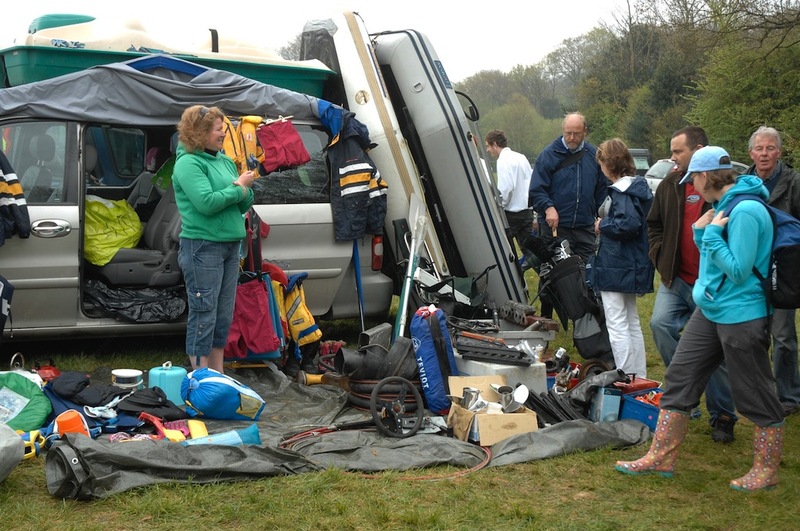 IT’S TIME for my annual pilgrimage to Lord Montagu’s little country pad down at Beaulieu in the New Forest for Europe’s biggest boat jumble, which takes place on Sunday, April 17. As in previous years, thousands of boat owners from all over the UK (and many parts of Europe) will be converging on the site to pick over the cast-offs from hundreds of other boat owners! I’m totally addicted to this junk fest – and it’s normally all my poor wife can do to prevent me coming home with all kinds of bits and pieces that generally lie around in the garage until she gets fed up with tripping over them and I’m told to get rid of them. It’s always a great day out – even just for the chance to have a yarn with other yachties and highly recommended. Admission to Beaulieu boat jumble is £8 for adults or £6 for children if purchased in advance from the Beaulieu website at www.beaulieu.co.uk.